Secret: When an enemy minion attacks, return it to its owner's hand. It costs (2) more. "Dang, that's cold." - appropriate response to Freezing Trap, or a mean joke. Really, really excellent against basically all minions that don't have Echo or Battlecry. Can make some of the most dangerous minions in the game too costly to play, practically or otherwise, but can be disastrous if used carelessly. Partner with Snipe for maximum suffering. Freezing trap shunts their minion back into their hand, then they pay the extra-high mana to get it out again, only for it to get Sniped on the spot. Ice cream for the soul. Hadronox comes down for my opponent and I'm running spell hunter with no silence. Lich King already died, so as soon as he drops his spider I figure it is all over. I Flanking Strike the lone Hadronox and come to grips with the fact that I lose this matchup even as I hold out the small hope that he will attack my wolf for value before killing his spider. I know there is no way: I've got three secrets out that he hasn't triggered yet, no way does he risk it. God I love this card sometimes. this card isn't fair when the minion that attacks has a mana cost of 9 or higher. A 9 mana minion now costs 11 and you can never play it if you don't have coin. The coin or innervate does nothing if you have ten mana. You need emperor thaurisan. 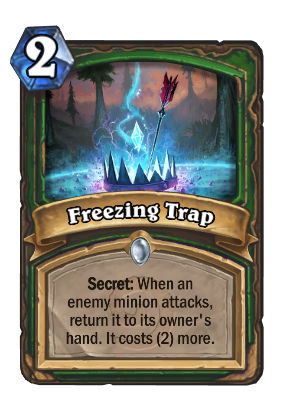 Hopefully they change this to correctly freeze the minion who attacks instead of sending it back to the hand with +2 to cost. Just opened a golden one, never realized it looked so good. Don't you hate it when a Druid attacks into this with Darnassus Aspirant? Dont you love it when your oponents attacks a 9 or 10 mana card into this? I think this card is very overrated and whatever the amount of people using it is, it should be smaller. I see its uses obviously, but you only have 30 cards at your disposal and I guarantee that the vast majority of the time there are better cards you could be using in your deck than this one. When an enemy minion attacks, silence it, then destroy it. Put a strictly worse version in the enemy hand. Sound any better when phrased like that? Had this in play and had 4 health left with a taunt and a minion. The enemy has a V-07-TRoN. Trap activates. Enemy concedes. It was a good day. So it says "Owner's Hand" but if you get to freezing trap something that was taken with Mind Control or Slyvanas, it goes to the controller's hand. The reason is the game has no memory of who owns which card, only who currently has it under their control. When A creature is mind controlled, it no longer is your card and is now owned by the player who cast Mind control. Hence why a Shadow Madness death-rattle creature (like harvest golem for example) dies the player who killed it gets the 2/1 minion not the original owning player .